There are 5 days left until our National Peace Academy PeaceMeal online course begins! 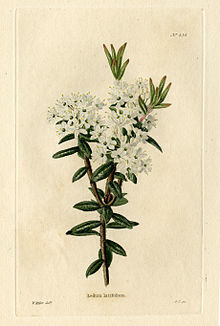 You might be wondering, “What on earth is Wesukipukosu?” More widely known as Labrador Tea, Wesukipukosu is a Cree term meaning ‘bitter herbs.’ The evergreen shrub has been a staple hot drink of Northern peoples since the first humans crossed from Asia to America. The tea is made by lightly steeping cleaned, crushed, dried leaves. It acts as a mild digestive and perks up one’s appetite and is enjoyed by many across North America. Moving from the sphere of inner peace that we’ve been exploring for Mindful Monday and Tasty Tuesday, we’re using Wednesday to move onward to topic of culture. Your challenge? Identify a food that is native to your culture or to your environment or geography. Do a little bit of research to learn more about it’s history, how it is grown and/or prepared, and take some time to reflect upon its importance. If you can, find some to make and enjoy on your own or with loved ones. This entry was posted in Blog by hannahrenglich. Bookmark the permalink.